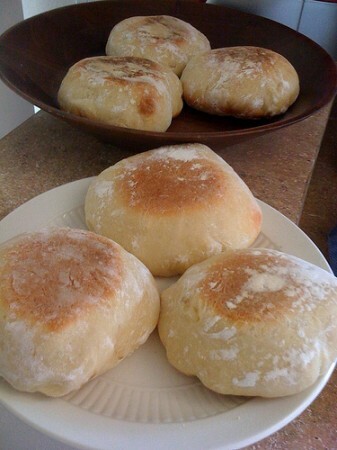 For this week’s breadmaking adventure, I made english muffins. I had looked up a few recipes for them before because they really are one of my favorite bread products, but I just wasn’t inspired. But then, as I was searching for a recipe for buns for some veggie burgers I was planning on serving for dinner, there it was. Just one column over from traditional burger buns in my amazing Burgers book by Paul Gayler — a perfectly simple english muffin recipe. 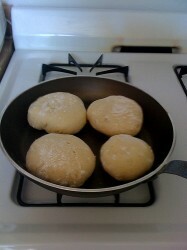 I hadn’t even thought to look there for bread recipes until I wanted to make buns. …then kneaded the sticky dough for a while longer on a well-floured surface with well-floured hands until it was smooth, elastic and no longer sticky. I let it rise for an hour, then kneaded the now-huge ball of dough a bit longer before cutting it into 10 pieces and forming them into balls. I let them rise for 30 more minutes on a floured baking pan with another pan sitting on top of them — the tops of the dough balls need to be floured as well so the top pan doesn’t stick — and since I didn’t have enough baking pans to cover all 10 muffins, I improvised with a cake pan and some bowls. You don’t want too much weight on them — just enough to help them keep their disc-like shape. I then heated up my nonstick pan to a relatively low heat — the book calls for cast iron, but I don’t have it. But whatever you do, don’t just use a regular metal pan. I tried it in an attempt to maximize my cooking space and the muffins burned almost instantly and were a huge pain to clean up. Once the pan is hot, cook the muffins in the pan for 10-12 minutes on each side until they’re golden brown and spring back to the touch. My first batch got a little dark on the bottom, so I turned the heat down a bit and the second batch turned out perfectly. In all, it was simple. The only time consuming part was the cooking since I had to do them in batches of 3-4, but even then I’d just set a timer since they didn’t need to be constantly tended. The best part was that what I came away with were perfectly beautiful and delicious English muffins — I was planning on freezing them to save for future breakfasts, but we (mostly me) ate them too quickly to save any. Next time I’ll have to figure out how to fork-split them so they get the proper nooks and crannies! You should definitely try it! I just made whole wheat ones today (just substituted half the flour with whole wheat flour). Hope they’re as tasty — we’re having them for dinner. And, the recipe makes 10, so enough to last a while… though we finished the last batch in less than a week! Oh my goodness those look so fresh and delicious! I may have to try this recipe!